mTrip has updated their white label offerings with a new design and include more visibility and revenue generating features. Following the release of the latest update for their commercial apps, mTrip has strengthened their white label offerings with a slew of improvements. A industry leader in white label applications for tourism boards, tour operators, travel agents and travel publishers, mTrip has completely redesigned their offering, increased visibility and improved revenue generating features. Increasing customization options and improving the user’s interaction with the application, mTrip’s white label apps now feature a flat design. Inspired by Apple’s iOS 7 and Android’s Holo design theme, the design now make it easier for brands to incorporate their colors throughout the entire application. With the increased customization options, destinations and brands will also have improved visibility with the new design and sharing features. 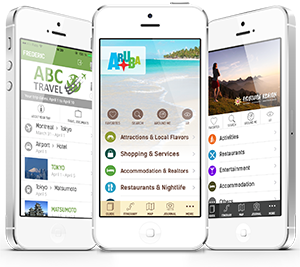 Tourism boards, tour operators and travel publishes can also take advantage of the updates and additions to the revenue generating features such as in-app advertisements, sponsored listings, bookings and special offers. These features are all optimized to generate revenue without being intrusive to your visitors or customers. mTrip has also updated existing features such as 100% offline maps & directions, travel directory, suggested tours, augmented reality and sharing features have been revamped with more options, easier user execution and better results. Some of mTrip’s newest customers include Daylesford and the Macedonean Ranges in Australia and the Dominican Republic who have both just published their official applications with the latest improvements.